Easter Monday? I read about this designated day three times yesterday; each time realizing I never thought about the Monday after Easter being anything special. 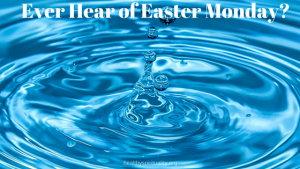 Have you ever focused on Easter Monday? With the “big event” featured on Sunday – He is risen! – Monday seems a letdown, a back to work routine, a ho-hum-who-cares type of day. But after seeing Easter Monday referred to multiply times – duh, a spiritual 2×4 wake-up call – I figure I ought to find out more about this day. And what I discovered sure was interesting! I am beginning to appreciate the spiritual practice of being curious and asking questions to explore different points of view. Easter Monday is an official holiday in many countries such as England, Northern Ireland, and Wales. It is also observed as a public holiday in dozens of other countries around the world, including Australia, Italy, Netherlands, Uganda, and Belize, for example. Easter Monday, also known as Bright or Renewal Monday, Wet or Ducking Monday, and Dyngus Day, is the Monday immediately after Easter Sunday. It is observed by many Christian groups, but primarily by the Eastern Orthodox and Roman Catholic traditions. What’s with these strange names? These other nicknames reveal some interesting history about this day. Bright Monday or Renewal Monday -Greek Orthodox churches feature Bright Monday with special liturgies. Actually. the entire week up to and through next Sunday is called Bright week and contains special liturgies. Some liturgies include priests sprinkling holy water, bell ringing, and a procession that involves children participating by holding religious icons. I thought it was interesting in some Orthodox churches during Bright Week, the holy doors that lead to a room full of icons are kept open, the only time of the year this happens. The open doors represent the stone being rolled away from the tomb of Jesus. Think I will view open doors differently this week. Wet Monday or Dyngus Day – Ready for a fun insight into Easter Monday? In Hungary, this day is often called Ducking or Dyngus Day Monday. This is because there is a very old tradition that young men would duck or dip their wife or girlfriend in a pond. I also read that siblings and/or spouses wake each other up by pouring buckets of water on each other accounting for the name “Wet Monday.” Let’s not share this idea with our kids or hubbies. On “Ducking Monday” as men visit women and asked for permission for sprinkling by reciting a little Easter poem, they sprinkle them with some perfume (or sometimes a bucket of cold water in the countryside), and they get eggs (mostly of chocolate) in exchange. Women get their turn on Tuesday by throwing plates and dishes at the men beside more buckets of water. This is not a new tradition, having roots bach to 966 AD when Prince Miezko was baptized. Since then Easter Monday and its fun ritual of sprinkling or throwing water have been celebrated. Along with the water, Dyngus Day includes dancing, beer drinking and a large feast with traditional foods. How did you spend Easter Monday? For me I worked at the church and then home to write this blog. A return to the routine, ordinary daily life. Thinking about Easter Monday, I noticed the Bible doesn’t say anything about what happened on Easter Monday. But the disciples knew something had changed. Mary Magdalene knew the tomb was empty. She saw the risen Christ. Jesus began appearing to the others. They didn’t know exactly how their future would evolve, but they knew Easter wasn’t over and new life was emerging. Jesus conquered death and the devil and gave to each of us the promise and hope of eternal life. We remember and rejoice in Easter Sunday for its reverberating restitution in the rest of our life. Easter isn’t over – The season of Easter continues for 50 days until Pentecost. Easter isn’t over – Each day we live as Easter people forever transformed by the resurrection. Easter isn’t over – Like the disciples, we don’t know the exact details of what the future holds but we know who holds us. Easter isn’t over – Moment by moment, remembering who God is, what he has done for us and that he knows our names and calls us his children. Easter isn’t over – let’s splash some water on our hearts and minds this week after Easter and give thanks. How about you? Ever hear of Easter Monday? How did you spend that day?